The Calvert County Department of Public Works is in the planning stages on a project to meet increasing demand for water service in St. Leonard. 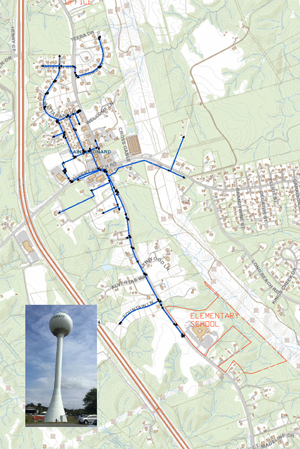 Construction will begin in 2019 on a new well and water tower to be located along MD Route 756/St. Leonard Road near Collette’s Way. The existing St. Leonard water system is currently at 93 percent capacity. The new project will ensure proper distribution system pressure, provide for adequate fire suppression reserves and balance the system supply in coordination with the existing St. Leonard water storage tank.